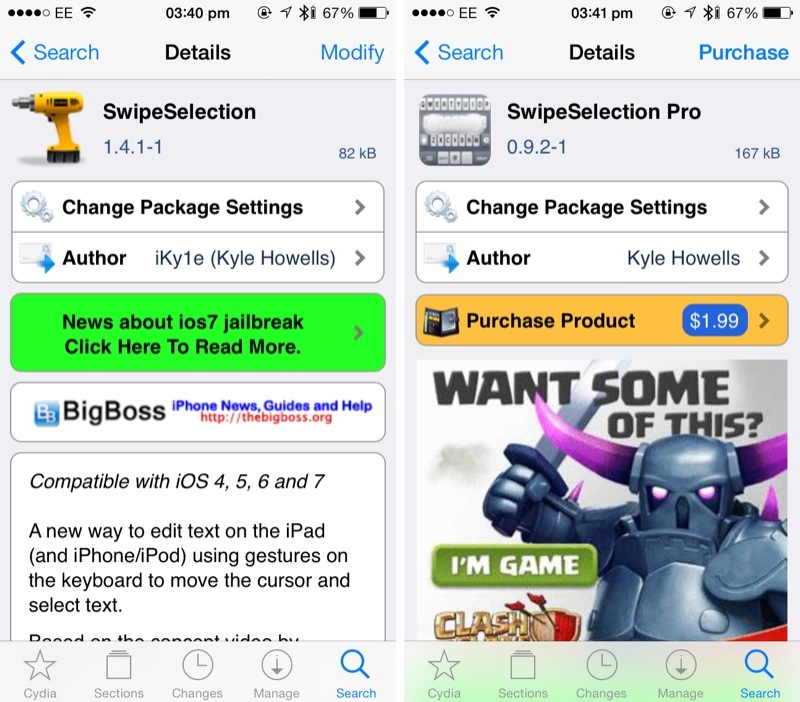 The impressive SwipeSelection jailbreak tweak has been updated for iOS 7, and support for ARM64-iDevices (the iPhone 5s, iPad Air, and iPad mini with Retina display) has been added. Plus, a new “pro” version of the tweak, SwipeSelection Pro, can now be purchased in the Cydia Store for $1.99. SwipeSelection Pro adds a number of new, useful features to SwipeSelection. As a reminder, the free jailbreak tweak allows users to swipe along the iOS virtual keyboard in order to move the cursor. It provides iDevice users with a much easier means of adjusting the cursor position on an iPhone, iPad, and iPod touch; if you often write and edit text using an iDevice, SwipeSelection will prove incredibly useful. The original jailbreak tweak first launched in the Cydia Store in May 2012; it was based on an impressive iOS concept which has yet to officially appear in Apple’s mobile OS. Changes made in SwipeSelection Pro first include the addition of a Settings app pane, and here jailbreakers have the option of enabling or disabling the jailbreak tweak outright. But that’s not all. In the Settings app, users of SwipeSelection Pro can also alter their iDevice’s “swipe sensitivity” (that is, how responsive the swipe gesture is), the speed of one’s cursor, and also have the option of activating the jailbreak tweak using a gesture. You can pick a swipe-able area for SwipeSelection Pro, too, and a three-finger swipe can also be configured. If you’ve been enjoying using SwipeSelection all these years, then the paid package will definitely be of interest. SwipeSelection can be downloaded free of charge in the Cydia Store, and the more advanced SwipeSelection Pro is available for $1.99. Both are optimized for iOS 7 and are compatible with ARM64-Devices. See also: DisplaySearch Hypes Apple’s “iPhone 6,” “iPad Pro” And “iWatch”, Apple CEO Tim Cook Talks China Mobile Deal In A Rare Television Interview, and The 5 New Features We’d Like To See In Apple’s iOS 8.